We’d love your help. 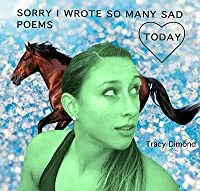 Let us know what’s wrong with this preview of Sorry I Wrote So Many Sad Poems Today by Tracy Dimond. Sorry I Wrote So Many Sad Poems Today is a collection of poetry that explores the humor in dark thoughts. To ask other readers questions about Sorry I Wrote So Many Sad Poems Today, please sign up. These are depressing if you're a 20 or 30 something. Too real. Much too real. It took me a bit to get into her style. But in the end I wished there were more poems in this collection. I read it in the PDF version having missed the initial run... Great stuff. Treading some of the ground a lot of poets are trying to navigate right now (reminders of the Mira Gonzalez book) but with a much more confident stride. Sure footfalls. Which is a funny thing to say about a book that voices so much personal insecurity and a hunger to grow and be. But it never oversteps and stays spot on the whole way through. Get the PDF now, and look out for whatever is going to come next. My sister likes to take a drive to listen to music because it makes the songs sound better. She calls is "turning corners." Tracy's poems turn corners, always going left and right, always making our sads sing better. This book looks and smells and feels beautiful. It reads beautifully too. I read it once and then immediately read it again. These are good poems that are sometimes funny but all come from a place of sincerity. Please read them. This book is full of funny, witty and sad poems. Read it. It's really good. The one about the crab pretzel was my favorite - thats what my life is like. 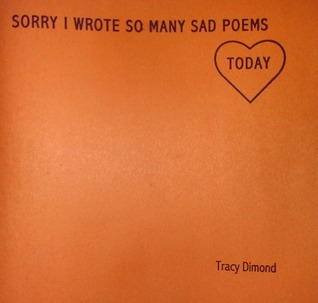 I'm not sorry Tracy Dimond wrote so many sad poems today. I'm very happy about this. I want more sad poems, Tracy. More. I am not sorry that Tracy wrote so many sad poems. In fact, I'm freakin' happy about it. Beautiful chapbook to own and cherish always.